My week in the garden was interrupted by appointments and by book club meetings, but it still managed to be a fairly productive one. One task which I had had on my list for months but kept pushing further down that list was pruning 'Big Momma' Turk's Cap. 'Big Momma' is extremely well-named. The two specimens that I had planted along the south side of my house a few years ago had grown to the point that they seriously threatened to devour the house. They had grown up to obstruct a couple of windows and were reaching for the roof. This week I decided I couldn't wait any longer and, trusty Felco pruners in hand, I spent hours whacking away at those plants. By the time I finished, they were mere shadows of their former selves. I had cut them back to about three feet tall. I'm quite sure this will not discourage these hardy plants. By the end of the year they'll be back covering the windows again, unless I find the time and energy to keep them trimmed. There was a lot going on in the garden this week. My husband continued with his project of laying a moss rock edging around the beds. Things are looking good on that front. Moreover, there are a lot of new blossoms brightening those beds, as well as some little visitors adding interest to the plants. As I was walking by one of the beds, I looked down to see this little ladybug. I encounter them frequently around my garden - which probably just means that I have plenty of aphids for them to feed on. When I walked out my back door this morning, I noticed this 'Darcy Bussell' rose and 'Rouge Cardinal' clematis blooming side by side next to the porch. 'Hot Lips' is one of my favorite salvias. The mandevilla vine by the patio has bloomed constantly since I planted it and shows no signs of slowing down. This old 'Dortmund' rose bush has been putting on quite a show this spring. The various lantanas around my garden - and I have several - are beginning their bloom. I really like the combination of colors on this 'Dallas red' lantana. In an earlier post, I told you about the threat to Knockouts - and indeed all roses - from rose rosette disease, but my 'Radazz' plants are healthy enough so far and, if they go, they are going in a blaze of glory! And this little American Painted Lady butterfly is very happy for those bright red blooms. In the front yard under the red oak tree, the oak leaf hydrangea is just about to be in full bloom. It's probably my favorite of all the hydrangeas, most likely because it seems to be the toughest. Much of my time in the garden this week has been spent watering plants. It is very dry once again and the forecasters are telling us to expect continued drought conditions over the long term. It is shaping up as another challenging summer. But then, it's always something, isn't it? Have you heard about the new threat to the plant that we thought was impervious to all threats? Yes, I'm talking about the Knockout rose. The first Knockout was introduced in 2000 and quickly became a hit because of its toughness and its ability to produce masses of flowers over a very long period. 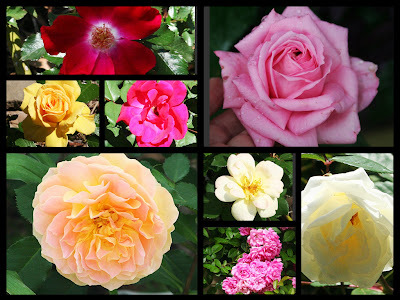 Many people found it to be the perfect landscape rose. It did not suffer from blackspot. It was forgiving of neglect, more drought-tolerant than most roses, which has certainly proved a boon in many areas over the last few years. It did, in fact, seem to be the perfect rose for the lazy gardener. Since 2000, many other colors and varieties have been added to the original single cherry red, and many of us have happily added the plants to our gardens. At present, I have some of the single reds, one double red, some yellows, and pinks in my garden. They all perform well for me, although the yellows perform less well than the others. To lose all of these plants would leave a very large hole in my landscape, but that's what a recent article by Steve Bender in Southern Living magazine warns us could happen. I was alerted to the article by my blogging friend Annie in Austin, and I read it with growing dismay. The disease that is already devastating Knockouts in some areas poses a threat to all roses, and I have about forty roses in my yard. This could potentially be a knockout blow for all of them. The disease that is causing all this angst is called rose rosette disease. It is a virus that is spread primarily by a tiny mite. It causes medusa-like bunches of bright red shoots on the plant. These shoots produce flowers that are very distorted and un-rose-like. Eventually, the plant begins to die back. Once the disease starts on an individual plant, that plant is a goner. There is no known cure for the disease. The best prophylactic action is to rip any diseased plant out immediately, bag it, and dispose of it. Ironically, the disease was first seen as a savior - a weapon in the fight against the wild Multiflora rose which had escaped to become a highly invasive species in many parts of the country. Rose rosette disease was able to wipe out many of the stands of Multiflora when all else had failed. The problem was, when the virus ran out of wild roses to attack, it made the jump to gardens and public landscapes. And what is the most commonly used rose in large public landscapes these days? Knockouts, of course. Formerly believed to be impervious to diseases, the Knockouts proved vulnerable to the tiny mite and the virus that it carries. The disease has now spread from the Northeast to the Midwest and down to South Carolina and northern Georgia. It has been seen in Alabama and northern Mississippi and even as far west as Fort Worth. The disease seems to thrive in drought conditions, which is probably not good news for the foreseeable future of roses in these areas. Besides the Knockouts in my garden, the other roses that I have are all either antiques or David Austin roses. I planted them because they are all tried and true, very tough varieties. But then so are the Knockouts. To see all of this beauty felled by a tiny mite and a tinier virus would be a very sad thing. Pink Knockout rose in my garden this spring. This has been a sad and disappointing week on so many different levels, for the country and for those of us who love it. Thank goodness there is always solace in the garden. Walking through the vegetable garden today, I was happy to see my squash plants that were just emerging from the ground last Friday already have true leaves and a sturdy appearance. There are few vegetables I like better than squash and it looks like I may be able to indulge my appetite in a few weeks. I had hoped to get my cucumbers and green beans planted this week, but every time I planned to plant, we had another cold front blow through. The forecast is for temperatures as low as 39 degrees F. tomorrow night. So I guess I'll wait a couple more days. Here's the tecoma. It's a color that I had not seen before. I have two large tecomas in my garden, but they are both the traditional yellow - 'Yellowbells,' as we call them. I got two of this new variety and I'll be interested to see how they perform. The spot where I've planted them probably has more shade than they would prefer, but I'm hoping they are adaptable enough to be happy there. This is 'Lafter,' bowed down by raindrops after our rain yesterday. I like the mix of colors in the blossoms - yellow, orange, peach. Lovely rose. And speaking of roses, the David Austin rose 'Darcy Bussell' gave me its first bloom of the year this week. I do love the David Austin roses and I have several of them in my garden. Another first this week was the 'Apple Blossom' amaryllis, blooming here next to the 'Red Lion' that I've shown you in previous posts. Don't those blossoms just whisper "spring"? Here's hoping our next week will be a happier one, and, whatever happens, that our gardens will always be there for us when we need their comfort. April may be known for its showers, but in my garden, it is also known for its flowers. This is the first month of the year when the garden is truly full of flowers. Here is just a sample of what's blooming in my zone 9a garden this month. The 'Red Lion' amaryllis is roaring - the first of the amaryllises to bloom, other than the St. Joseph lily. These violas have been blooming since the dead of winter. They were planted in a pot where Gerbera daisies bloomed last summer. Now the Gerberas are coming up among the violas but haven't started to bloom yet. This stand of white yarrow has been in bloom since early spring. The autumn sage blooms off and on for most of the year. This little mandevilla vine was added to the bed next to the patio this spring and has been in bloom continuously since. Euryops, or bush daisy, is just beginning to bloom. The 'Mystic Spires' salvia is attracting butterflies and hummingbirds with its deep purple blooms. So is the nearby yellow lantana. The native red ruellia is a hummingbird attractant. Kevin the gnome stands in a bed of reseeded marigolds. This blue-eyed grass blooms in a pot in the little fish pond, but it has also seeded itself in the planting bed that surrounds the pond. Another plant beloved by the hummingbirds is the red salvia. The pink oleander is beginning to bloom. The orange bulbine is in bloom just about twelve months of the year. 'Hot Lips' salvia always looks like it has had a Botox treatment! Butterflies love yellow cestrum. And so do I. Thank you to Carole of May Dreams Gardens for hosting Bloom Day again this month and thank you for visiting my April garden. Happy Bloom Day!